Don't Walk to the Beach - Stay on the Beach! Gulf Gaze is a family beach house sleeping a maximum of EIGHT (8) people including children of all ages. We make every effort to make your stay as enjoyable as possible. You will find the house ideally suited for a relaxing vacation. A large percentage of the guests return annually. SORRY HIGH SCHOOL/COLLEGE GROUPS, CHURCH GROUPS, WEDDINGS PARTIES, AND LARGE FAMILY GATHERINGS RENTING MULTIPLE HOUSES CANNOT BE ACCOMMODATED! The house is directly on the Gulf of Mexico beach in the small private community of Cabana Beach Estates. Cabana Beach Estates is about 12 miles west of Gulf Shores, Alabama off Fort Morgan Road (Hwy 180). 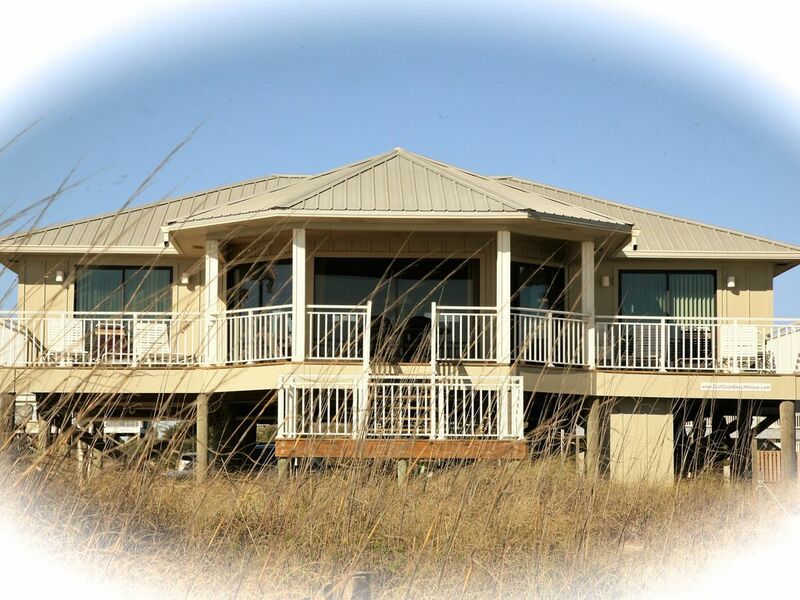 During walks on the beach, you will enjoy miles on natural, undisturbed beach and dunes on each side of the house. The house has four bedrooms and two baths. It is laid out with two bedrooms and a bath on each side of a great room. Entire front of the great room is glass providing the best possible view of the Gulf and beach. Front bedrooms have sliding glass doors opening onto the deck. Guests Book Comments:: What a beautiful view! We just loved everything about your wonderful home. The beach was beautiful. The kids loved chasing crabs. We can't wait to return to this charming, cozy home by the sea! We will surely miss looking out at the beautiful ocean every morning. Thanks for the wonderful memories! We will be back! Guest Book Comments:: Our first visit to Gulf Gaze, and we have truly enjoyed our vacation. We hope to return next year! My family had one of our best vacations here at the Gulf. The house was a perfect distance from the tourist traps. Speaking of traps, Kiva Dunes was a great golf course and only a mile down the road. We spent most of our time on the beach tanning, swimming, and fishing. I caught several mullet, one catfish, two blue fish, and even hooked a manta ray! We will be back! Guest Book Comments:: We planned this trip for 5 months. It was everything we had hoped for. The house was great with the covered deck and excellent view. Low traffic on the beach was ideal. Hailey celebrated her 13th birthday on the beach! This was a very special trip - our whole family spent a relaxing week together and look forward to doing it again! On our last night, the dolphins came up and performed for us. We are not ready to go home! Breath taking 180 degree view of Gulf of Mexico and beach. Space for three cars under the house. No RV's or campers are permitted. Bath towels and wash cloths are provided. You are responsible for beach towels. The spacious kitchen overlooking the beach features granite counter tops, and is fully equipped including large microwave oven, blender, toaster, coffee maker, large electric mixer, garbage disposal, and all the dishes, glasses, and cooking utensils you should need. 12 foot wide deck full width of beach side of house with center portion covered. Deck furniture provided for your dining pleasure.